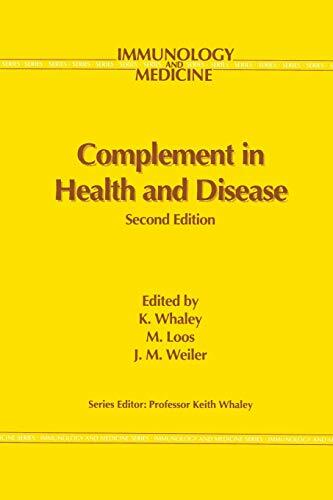 Since the first edition of Complement in Health and Disease was published in 1986, significant advances have been made. The cDNAs for all of the components and some of the receptors have been cloned and sequenced. The chromosomal localization and the structural organization of a number of these genes have now been determined. These advances are now facilitating research into the structure of the complement proteins, the nature of the complement deficiency syndromes, the regulation of complement gene expression and the role of complement in different diseases. This edition contains contributions from both basic and clinical scientists in a format which we hope will appeal to both immunologists and physicians who wish to know more about this fascinating and important host defence system. The introductory chapter by John Weiler presents a historical background to research on the complement system and describes the biochemical events occurring during activation of the system. In Chapter 2 Alastair Dodds and Tony Day discuss the phylogeny and evolution of the complement system. The techniques of protein chemistry and molecular biology have provided powerful insights into the modular structure of complement proteins and the evolution of the complement system. The structure and organisation of the complement genes is described in Chapter 3 by Ken Reid and Duncan Campbell. This chapter describes the modular structure of the complement proteins and some of the mutations which are responsible for deficiencies of individual components.